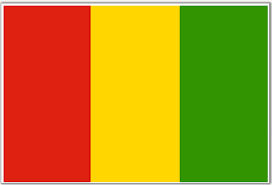 Guinea, formerly known as French Guinea is a country located in the West Africa. Guinea comprises population of about 11.6 million (2014). It is a predominantly Islamic country, with 85% of Muslims representing the nation. Talking about telecommunications, the mobile cellular system in the country is growing rapidly and had an estimated 4.8 million lines in 2012. There were 95,000 Internet users in 2009, 161st in the world and these stats jumped to 162,202 users by 2012, reaching 1.5% of the population in 2012. The most popular form of gambling in the nation is lottery. The national lottery of Guinea is La Loterie Nationale de Guinée (LONAGUI). The online lottery is legal but there are no domestic online lottery operators so far, due to low Internet penetration rate. There are land-based casinos operating around the country offering the most popular games to players like blackjack, poker, and roulette. Casinos have to obtain proper licenses to operate, though. The Ministry of Economy, Finance and Planning is the government body controlling and supervising all the gambling operations. Players are eligible to visit offshore online casino. Therefore, many foreign online casinos accept players from Guinea.